Make your memories come to life! We take seconds of video in front of our green screen station and transform your still pictures into Flickbook that comes to life on-site at your event. Within minutes you will be able to watch the pages get printed, cut, and assembled. 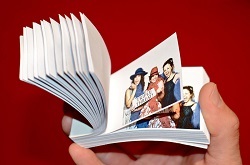 Your 60 images will be turned into an approximately 2″ x 3″ photo book that is yours to take home at the end of the event.